2015 Nepal Earthquake | USAID CIDI is an education organization that is focused on effective public donations in support of disaster relief. In April 2015, a magnitude 7.8 earthquake struck approximately 48 miles northwest of Nepal’s capital city of Kathmandu. The earthquake and subsequent aftershocks—including a magnitude 7.3 earthquake on May 12—resulted in nearly 9,000 deaths, damaged or destroyed more than 887,000 houses, and caused widespread damage to public infrastructure, including water systems and health facilities. Within hours of the seismic event, USAID’s Office of U.S. Foreign Disaster Assistance deployed a Disaster Assistance Response Team (DART)—including urban search-and-rescue (USAR) specialists—to Nepal. USAID provided 6,200 rolls of heavy-duty plastic sheeting for the Nepal earthquake response, which is enough to help up to 310,000 people with emergency shelter needs in advance of the monsoon season. USAID chartered 10 cargo planes over three weeks to deliver more than 300 tons of critical supplies. In addition, USAID purchased and airlifted emergency medical supplies to Nepal—including enough medication, surgical instruments, sterilization materials, gloves, and basic medical items—to help 40,000 people for three months. 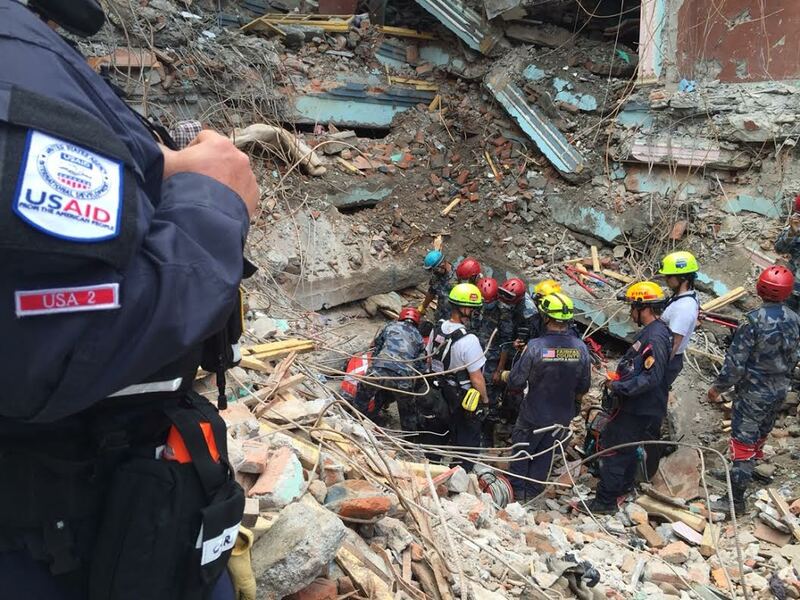 USAID DART urban search-and-rescue teams helped pull a 15-year-old boy out of the rubble in north Kathmandu, five days after the earthquake hit Nepal. 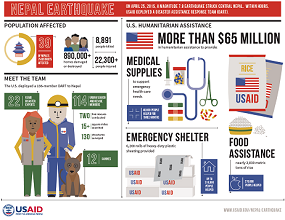 The DART demobilized on June 9, 2015, but USAID disaster experts remain in Nepal. USAID remains committed to supporting earthquake recovery efforts in Nepal, including earthquake-resistant infrastructure and reconstruction, food security and livelihoods, and the protection of vulnerable populations. 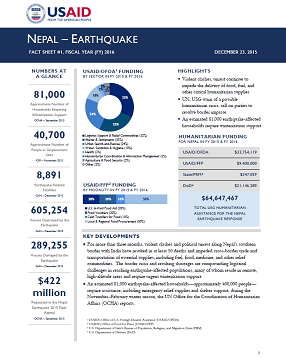 For more information on the U.S. government response to the 2015 Nepal Earthquake, visit www.usaid.gov/crisis/nepal. When disasters occur anywhere in the world, Americans generously offer assistance to those in need. Decades of experience in disaster relief and recovery have shown that the best way to help people affected by disaster is to make cash donations to reputable relief and charitable organizations on the ground. These groups work closely with affected communities, know what people need and how to strengthen recovery efforts. Cash donations are the most efficient form of assistance. Unlike material donations, cash involves no transportation costs, shipping delays, or customs fees. It also enables relief organizations to spend more time providing aid by spending less time managing goods. Cash donations also allow relief supplies to be purchased in markets close to the disaster site, which stimulates the local economy by providing employment and generating cash flow. Organizations listed on the resources below are experienced and are participating directly in relief efforts. If you would like to know more about organizations you are considering for support, you can find detailed financial and programmatic information at: GiveWell, Charity Navigator, Charity Watch, and the Better Business Bureau.